Sometimes, you might want to use a chat conversation for personal use, for example, taking notes, bookmarking Internet URLs, saving attachments, maintaining to-do lists, etc. And what better way to do this than to create a chat thread for yourself. WhatsApp stores messages and attachments on the user’s device, rather than the server. Moreover, it recently started supporting all types of attachments, hence making it an ideal app for the above purpose. But how do you send a message to yourself on WhatsApp? Previously, it was possible to create a WhatsApp chat by picking your own contact from the Favorites tab/Contacts tab. But WhatsApp has since replaced the Favorites tab/Contacts tab with the Status tab, and it is no longer possible to send a message to yourself, unless you have another phone number, also registered on WhatsApp. In this article, we’re going to explore a workaround that allows you to create a WhatsApp conversation thread with your own number. If you follow our blog, you might already be aware of our web app called WhatsApp Direct, which allows you to send WhatsApp messages to any phone number without saving it to your contacts. And the same app may in fact be used to send a WhatsApp message to your own number. The below steps will guide you to send a WhatsApp message to your own number, and create a personal chat thread that you can use for bookmarking or reference purposes. Open WhatsApp Direct on your smartphone. Select the appropriate country code from the dropdown. Your selected code will be remembered by the app for future usage. Enter your registered WhatsApp phone number and a test message to initiate the chat. You will be redirected to a new WhatsApp chat with your phone number on it. Now that your personal chat thread has been created, it will remain on your chat list, even if you close the app. Whenever you want to bookmark a URL or attachment, or refer back to a text at a later time, just send it as a message in your personal thread. And that’s it, you can continue using the chat thread just as any other WhatsApp conversation, as long as you don’t delete it, or uninstall WhatsApp without having a chat backup. Note: WhatsApp Direct works on iPhone, Android and Windows Phone devices. Did you like this little trick to send WhatsApp messages to your own number? Let us know in the comments below. 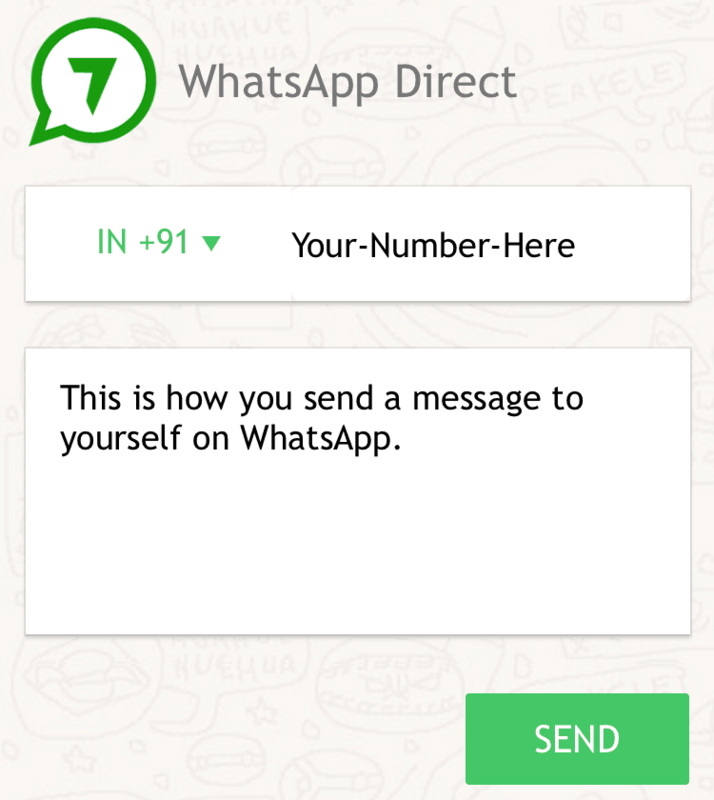 Disclosure: WhatsApp Direct is a home-brewed app created at 7labs for the benefit of all our readers. As such, we built this app keeping the privacy of our readers in mind. Any information that is shared on WhatsApp Direct (phone numbers, messages, etc. ), is sent directly to WhatsApp using their APIs. We do not store this information, nor do we forward this to other third parties.